Heidi Foster writes: “I went to the Ypres Castle Inn on Sunday night, April 10, a day of the week when John Izod, who died last week, would traditionally make his way to the back of the pub and be surrounded by friends, entertaining them with his wit. Several of us felt we wanted to regroup this first Sunday after the sad news and tell stories and share memories (which we did round a table just beyond the bar) and Sunday night’s music (blues and soul classics) would have been his kind of music and he would have loved it. When I first moved to Rye, Friday was dance night at the Ypres and however painful John’s knees were, we had a jive – and great fun. But that eventually moved to Sunday, without dancing. Anyway on Sunday we were lucky enough to listen to the duo, Yoka and Big Ray, whose music was a mix of acoustic soul and blues classics interspersed with original material in an intimate setting – which John would have appreciated, probably trying to do some harmony. Yoka captivated us with her powerful and soulful vocals and anyone lucky enough to have been there will remember her voice, and flute and saxophone playing – awesome. If you are up for being transported into the Louisiana music world you will want to be at the next gig, it is on May 1 at the Hastings Stag in All Saints Street in the Old Town.. They were fantastic, so try and catch them – or visit www.yoka.london for an example of her singing. Another gig where I would have expected John to slide into the back seats and just watch, chatting with like minded people, was Saturday’s amazing gig at the Rye Community Centre – for which it was a fundraiser. I wasn’t convinced about going, but am so glad I rallied and joined the many people who came together to hear this extraordinary Cajun band called the Hotfoot Specials, from Brighton. Initially there seemed to be too many chairs though they were only put out across half the floor as lots of dancing was expected. Sure enough, as soon as the lights went out and the five musicians started, the atmosphere changed into participation and enthusiasm. Their Cajun music comes from Louisiana and other parts of the American South which were occupied by French Canadians after the British took over French territory in Canada. Louisiana was a French and Spanish colony before being purchased by the USA in 1803. Cajun music therefore has a long and varied history and the music soon got people two-stepping, and waltzing, almost immediately, or doing their own moves to this lively traditional music. The band created, with their drum, accordion, guitar and violin/fiddle and triangle music and a lot of love, an atmosphere that made people jump to the floor right from the first number. Andy Stuart also reviews the performance. “On the evening of Saturday April 9 you could almost smell the frying of shrimps at Rye Community Centre as the venue became the main centre of Cajun culture not just in the SE of England, but this side of the Atlantic! And it was the red hot sounds of the incomparable Hotfoot Specials that got the good folk of the Rye bayou on their feet dancing the night away to authentic Cajun two-steps and Cajun Waltzes as well as freeform Denge three-steps! 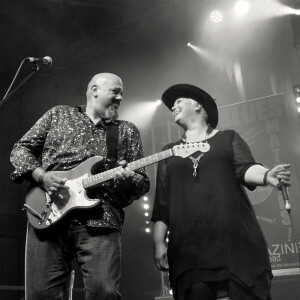 Rye was served up a real treat as the Hotfoot Specials made a welcome return to the town (after appearing at last year’s Rye Arts Festival) bringing the finest authentic Cajun sounds with them all the way from… Brighton! Before the gig started, which was a benefit for the venue to raise money for much needed repair work (at the community centre) and was generously sponsored by the George in Rye, the audience was in high anticipation – laissez les bon temps roulez! And they weren’t disappointed. The dance floor was packed throughout the gig with dancers snatching just a quick breath and a slug of cooling beer between each song before throwing themselves back into the fray! The Hotfoot Specials hail from East Sussex but their hearts and musical minds are forever in the Louisiana swamps! Chris Murphy, the leader and singer who plays the melodian, is the genuine article – US born. He is joined on violin by Kirsten Hammond, with Don Stewart on guitar. Grant Allardyce sits at the back on the drums, and the whole musical gumbo is help together by the mighty metallist – Mary Murphy – on the triangle! Previous articleLets go to the movies!